The Elstead Helsingor black finish 1 light PIR outdoor wall lantern in stainless steel is rated IP44 and features a circular wall mount, straight arm and upright lantern, with integral motion sensor, brimmed roof, protective metalwork and pill glass lantern. Part of the coastal collection and supplied with a manufacturers 15 year anti-corrosion guarantee. Please note that the PIR has a 2 year guarantee. Range 5m maximum: Time 5 sec – 5mins: Detection angle 90°. The sensor cannot be overridden and does not operate during daylight. A Danish inspired lantern suitable for installation in coastal regions. Made of 304 grade stainless steel and then painted in powder coating to give the metal extra durability. Available in black or silver finish. Exterior fittings must have an IP (Ingress Protection) rating which indicates the fittings ability to prevent solids and liquids penetrating the enclosure. The higher the number, the greater the protection. The minimum rating for an outside light exposed to the weather is IP23. 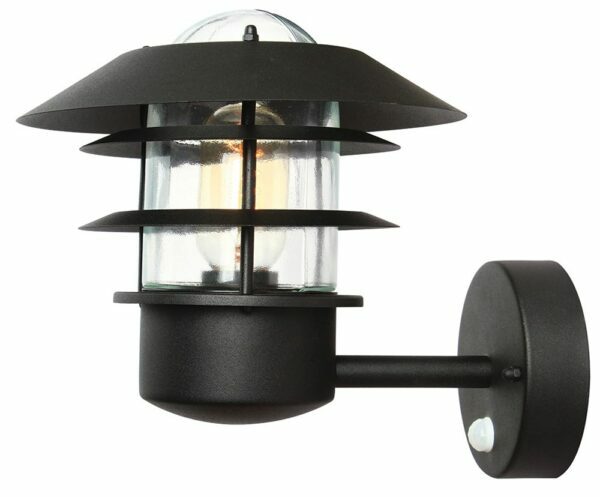 This outdoor wall lantern is rated IP44. There are matching fittings available in the black finish Helsingor exterior lighting collection; please see below. Also available finished in silver. This coastal light is supplied by Elstead Lighting, a British company that specialise in the manufacture and distribution of quality decorative lighting such as the Helsingor black finish 1 light PIR outdoor wall lantern in stainless steel and rated IP44 you see here.